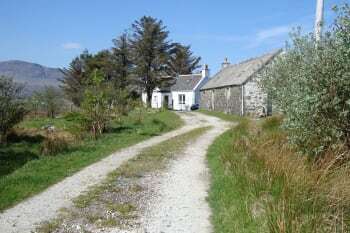 Fairy Hill Holiday Cottage is a traditional Crofter cottage which has been renovated to provide an ideal holiday home for your visit to the Isle of Skye. The cottage is at the end of the road in the crofting township of Ellishadder one mile south of Staffin, this cottage lies in a secluding and peaceful position looking over moorland and the Trotternish ridge. If you are looking for a quiet and peaceful holiday, this is it. There are no rooms available at Fairy Hill Cottage for these dates. The house is lovely, great views from all aspects. Clean, tidy and very comfortable. Nicely decorated and really spacious. Will definitely book again. Very peacefull and silent, a good place for a familiy or just for couple.